Fire Fighting Equipment cabinet makes and organizes fire fighitng equipment such as SCBA's, Bunker Suits, Fire Helmets, Gloves, Boots, Hoods, Escape Masks, Hoses, spanners, rescue equpment ready for use. With built in small key lock cabinet on the side so you don't have to break the entire glass of the cabinet which might go to the equipment. Makes sense! * Oversized Hood: Fits entire head completely. Covers a full head of hair, facial hair and glasses. * Extra Large Clear Vision Window: Provides wearer with clear view. Reduces chances of claustrophobia. * High Capacity Filter Cartridge: Stainless steel cartridge shell. Allows up to 30 minutes of filtered safe air. * Elastomeric cotton neck dam seals out polluted air. Adjustable two-point belt button helps fit mask securely to face. The ASE30 Fire Escape Hood will protect you from smoke inhalation and many other toxic gases. Guaranteed to provide up to 30 minutes of breathable air: enough time to escape any burning building, home, hotel, office or school. The number one cause of death in a fire is Smoke Inhalation (SI). Without using this smoke hood, you have less than 60 seconds to escape the deadly effects of Smoke Inhalation (SI). Safe Escape protects your head completely from toxic smoke and falling hot ash. * And many other toxic gases and smoke. * Single use, disposable unit. * Breathe normally. No nose clips, no can to breathe through. * Secure fit in seconds. * Easy Application: Slip on like a Halloween Mask. * Designed for ages 2 years and older. 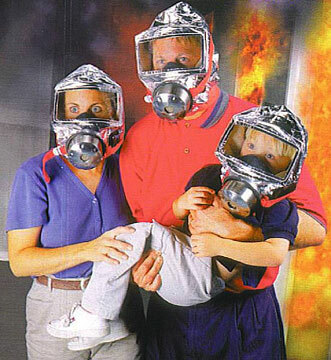 * Respiratory protection for emergency preparedness. * Head Hood and Mask produced with Flammable-Resisting Aluminum Foil cloth. * Withstands temperatures of 1400° F (800° C). * Actual Flame Tested and Radiant Heat Tested up to 1400° F.
* Protects the head from flame, thermal radiation and dropping dust from fire. * Form Fitting Elastic neck band keeps out foreign matter. * Dimensions of Sealed Plastic Container: 4.25 x 5.25 x 8.25 inches. * Portable for easy travel. o Smoke and Fire safety Hood Mask conforms with USFA-FEMA standards. o European Standard EN 403.
o Australian and New Zealand Standard AS/NZS 1716:1994.
o Thailand Disaster Prevention Department of the Interior Ministry. Factory Mutual Approved, ULC listed. FIRE AXE - MADE IN KOREA 36"